A special thanks to all who remembered the Pacific Institute in your year-end donations! It’s a big year here at the Institute, as we celebrate a quarter century of “research for people and the planet.” In those 25 years we’ve seen research formats move from black and white hard copies, to color reports, to digital files downloadable from our website getting the information out all around the world. There are many more ways these days to engage the important research from the Pacific Institute – like the “Need to Know” series of briefs on water rates (see first story below), videos, new websites, online tools, curricula, chronology, mapping, social media, news stories, and more. It’s about getting the research out there to make a difference! www.pacinst.org is your source! Water service providers face key challenges in forecasting and preparing for future water demand, staying fiscally solvent while providing fair prices, incorporating conservation and efficiency, and communicating clearly to customers about rates and service. The Pacific Institute conducted an extensive survey and series of workshops on water rates and finances to better understand how water is priced by more than a thousand different water providers in California, both public and private – and to help agencies identify effective rate-making strategies. Our “Need To Know: Water Rates” series, released in partnership with the Alliance for Water Efficiency and the Community Water Center, highlights strategies that help water service providers cope with the “new normal” or an era of decreased water demand due to a variety of factors from weather to the economy to increased conservation and efficiency. – The Keystone XL Pipeline: Red herring, symbol, or a piece of a puzzle? Peter Gleick identifies six major factors in our global water crisis, and six solutions for those problems. Learn where your water comes from and what it’s doing in that plastic bottle. The Safe Return Team received the annual Martin Luther King Leadership Award from the City of Richmond. City Council meeting, Mayor Gayle McLaughlin heralded Safe Return and its supporting organizations for our efforts to “invest in people not prisons” that lead the county to withdraw a jail expansion proposal and invest its realignment funding into transitional employment, housing, integrated services, and bail reform. In December, the executive committee charged with implementing AB109 realignment in Contra Costa County adopted a budget funding the community recommendations to reduce recidivism and increase opportunities for returning residents, and on January 15th the county’s Board of Supervisors adopted the committee’s proposed budget. Contra Costa has been recognized as a leader in the state for creating a formal Community Advisory Board, suspending a jail expansion, and investing in community-based programs, all recommendations that were researched and advocated by the Safe Return Team, the Pacific Institute, and other community leaders. Read more about the Safe Return project. In February, Pacific Institute President Peter Gleick kicked off his new blog “Significant Figures,” hosted on National Geographic’s Science Blogs. In “Significant Figures,” Dr. Gleick will write about noteworthy, informative, and provocative numbers and data; address confusions and challenges in understanding and reporting on science, misunderstandings or misrepresentations of science, and the complexities of interpreting science for policy makers and the public, including the issue of the use of “significant figures” in the classic mathematical and policy sense; and highlight important and controversial people – historical and current figures in the public discussion over environmental issues. Read Significant Figures by Peter Gleick. Check out the full list of recommended water reading here. 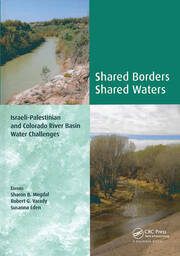 Research Associate Kristina Donnelly co-authored the chapter “Perspectives on Water Conservation in Israel and Palestine: Foundations and Future” in the newly released Shared Borders, Shared Waters: Israeli-Palestinian and Colorado River Basin Water Challenges. This collection of papers examines water management in two of the world’s prominent, arid transboundary areas facing similar challenges. In the Middle East, the chronically water-short Israeli-Palestinian region has recognized the need both to conserve and supplement its traditional water sources. Across the globe on the southwestern United States-Mexico border, Arizona relies significantly on the overallocated Colorado River, as well as on non-renewable groundwater supplies. For both regions, sustainable and cost-effective solutions clearly require innovative, multifaceted, and conflict-avoiding approaches. The Pacific Institute’s Water Program Co-Director Heather Cooley is featured in the article “Champions of the Earth” in Women’s Adventure Magazine (see page number 52 – which is 55 via the full-screen mode – under “Water for All”). Read the full article here (and see page number 52 – which is 55 via the full-screen mode – under “Water for All”). December marked the beginning of year three in the development of the WASH SMS platform through our pilot project in Indonesia. The Institute and our partners Nexleaf Analytics and PATTIRO have been developing two Indonesia WATER SMS systems in Makassar, South Sulawesi and Malang, East Java along with the many stakeholders in urban water governance – customers, poor residents without service, utilities, local government agencies, NGOs, and media. In a time when basic mobile phone mapping websites can pop up overnight, our participatory development process has at times felt drawn out, especially to some of the residents who are experiencing urgent issues such as two-month water shortages and want their grievances redressed immediately. Over the past few weeks PATTIRO staff brought all the stakeholders together in each pilot location for final Multi-Stakeholder Dialogues…. Read more. In March, Circle of Blue will begin publication of Choke Point: India, the first in a series of long-form reporting about India’s water, food, and energy challenges in an era of climate change. It’s part of the larger “Global Choke Point” project produced in partnership with the Wilson Center’s China Environment Program. J. Carl Ganter, Circle of Blue’s director, joined Pacific Institute staff to moderate and participate in panel discussions at the International Water Summit in Abu Dhabi in January. Mr. Ganter, vice chairman of the World Economic Forum Global Agenda Council on Water Security, also participated in sessions on water, sustainability, and urban design at the Forum’s annual meeting in Davos, Switzerland. Water Program Co-Directors Dr. Peter Gleick and Heather Cooley and Senior Research Associate Dr. Newsha Ajami attended the International Water Summit in Abu Dhabi, United Arab Emirates, on January 15-17. Dr. Gleick participated in the interview session“Assessing the Impact of Demand Side Management on Sustainability” with Former Minister of Water Abu-Zeid from Egypt and spoke at the workshop “Future Challenges Affecting Water Availability.”He was also a part of the closing panel to sum up the conference meetings. Ms. Cooley presented at the workshop “Global Institutional Cooperation for Enhancing Water Governance.” All three staff members attended meetings with representatives from Masdar and representatives of various government agencies. – presented the Pacific Institute’s California Water Footprint assessment to the California Water Plan State Agency Steering Committee in Sacramento. – participated in a Sustainability Roundtable convened by the U.S. Environmental Protection Agency’s Administrator Lisa Jackson in Washington D.C.
– presented findings from the Pacific Institute’s climate impacts, social vulnerability, and adaptation planning study – conducted in partnership with the Oakland Climate Action Coalition – at a Community Resilience Convening sponsored by the San Francisco Foundation. The convening brought together more than 50 nonprofit and community leaders to discuss strategies for engaging vulnerable communities in building resilience to climate change impacts in the San Francisco Bay Area. – gave a lecture at the University of California, Berkeley for a class on California Water and Society. – spoke at the America’s Cup Healthy Ocean Project: Sink or Swim as Bay Waters Rise at Pier 1 in San Francisco, California. – gave a webinar on the urban water demand model for California Urban Water Agency members. – presented at the California Climate Action Planning Conference at Cal Poly in San Luis Obispo. He addressed local government officials and planners on how to evaluate climate risks and vulnerabilities and how to improve community resilience in the face of hazards such as floods, heat waves, and wildfires. – gave a talk at the East Bay MUD Engineers Forum on the urban water demand model. – Dr. Peter Gleick will be present at the California Film Institute as part of the Science on Screen Film Series before the film Valley of Saints. The event will be held at on Thursday, February 21, at 7:00 pm at the California Film Institute, 1118 4th Street, San Rafael, Calif. Tickets are $12; $9 for CFI members. For more information and to get tickets, click here. – Dr. Gleick will also participate on a panel on Where Will the Water of the Future Come From at the New York Academy of Sciences on February 28. The event will run from 6:00 – 8:00 p.m. at the New York Academy of Sciences, 7 World Trade Center, 250 Greenwich Street, 40th floor, New York, NY 10007. To register for the event, click here. – Water Program Co-Director Heather Cooley will give the keynote talk on California Water: Local to Global at the CSU Chico Sustainability Conference. Ms. Cooley’s keynote will be Thursday, March 7 at 10:00 a.m. at the Institute for Sustainable Development at California State University – Chico in BMU 210. For more information and to register for the event, click here. – Heather Cooley is quoted in this Bloomberg piece by Jessica Resnick-Ault that aims to answer the question, “Is converting seawater to drinking water a profitable venture in the U.S. when there are cheaper options?” Read the full article here. – Ms. Cooley also spoke with James Temple of the San Francisco Chronicle on preparing for sea-level rise and risks among existing infrastructure and communities in California. The full article is available here. – Jane Christie-Smith of Impeller names Bottled and Sold one of the five must-read books on water. Read the full list of recommended books here. – Institute President Peter Gleick authored an op-ed piece in Yahoo! Finance speaking on the impacts of climate change, immediate need for renewable energy, and difficulty of these major transitions. Read the full article here.